Context: Ground-glass opacity (GGO) is a nonspecific imaging parameter for early-stage pulmonary cancer. In these cases, a definite diagnosis and prompt surgery usually yield satisfactory outcomes. Aims: This study aimed to assess the safety and feasibility of cryoablation treatment for lung GGO. Subjects and Methods: We reviewed the clinical data of 14 patients (19 lung tumors) with lung GGO and evaluated the adverse events, lung function, and treatment efficacy after cryoablation. Statistical Analysis Used: Statistical analyses were performed using the Statistical Package for the Social Sciences software (version 13.0; SPSS Inc., Chicago, IL, USA). Results: None of the patients exhibited serious complications, and lung function recovered to >95% after 1 month. During a follow-up, computed tomography scan at 24 months, the GGO appeared to have been successfully ablated in all patients. Conclusion: Cryoablation may serve as a safe and feasible option for the treatment of GGO. Lung cancer is the most common malignant tumor and poses a serious danger to patients; it is responsible for approximately 1.59 million deaths annually. As the early symptoms of lung cancer are not apparent and due to the lack of awareness regarding the importance of physical examination in these cases, patients are often diagnosed in the middle and late stages of this disease and are thus unable to undergo surgery. Moreover, the 5-year survival rate of patients with lung cancer is only 15%, which is an important factor for the high fatality rate of lung cancer. Furthermore, advancements in science and technology have led to an increase in the detection of solitary lung ground-glass lesions and attracted increasing attention. 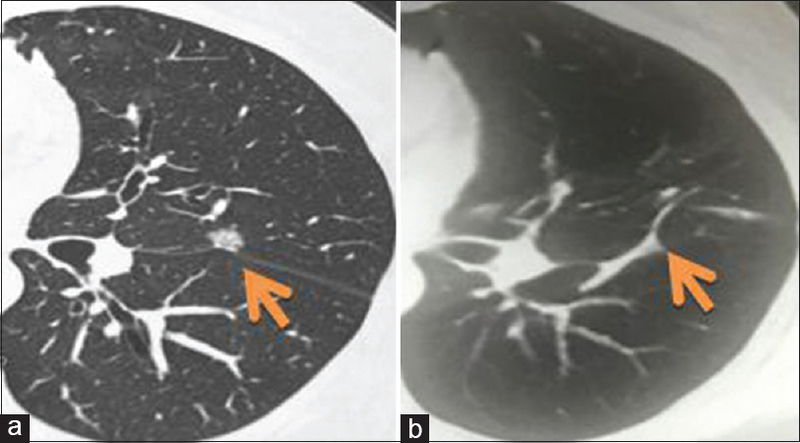 Ground-glass opacities (GGOs) are imaging manifestations on computed tomography (CT) that appear as obscure shadows covering the underlying bronchial structure and vascular structure of the lung. GGO is a nonspecific imaging parameter for early-stage pulmonary cancer. In these cases, a definite diagnosis and prompt surgery usually yield satisfactory outcomes. However, surgery represents an invasive therapeutic option, and benign lesion or small-sized GGO can be managed through conservative treatment or close follow-up; once malignancy is confirmed, timely surgical resection can be performed. Most cases with pure GGO (pGGO) do not exhibit invasive growth, and the pathological types primarily include atypical adenomatous hyperplasia (AAH) and adenocarcinoma in situ (AIS). However, for cases with mixed GGO (mGGO), the pathological types primarily include adenocarcinoma and AIS. Compared with pGGO, mGGO has a larger diameter and a higher degree of malignancy. Patients with pGGO are usually treated with close follow-up, and surgery is only performed when there is a significant change in the size or the appearance of the pGGO; however, some physicians advocate immediate surgery in these cases. Nevertheless, surgery is not suitable for patients with limited pulmonary reserve; in those patients, treatment with minimally invasive percutaneous imaging-guided cryoablation offers a safer solution. In the present study, we described the patients with GGO in the lung who refused to undergo surgery or biopsy. This retrospective study was approved by our Institutional Review Board. From July 2015 to September 2017, we treated 20 patients with GGO, including 12 male and eight female patients. We excluded six patients who were lost to follow-up (n = 6). Finally, a total of eight male and female patients (19 lung tumors) were included in this study, with an average age of 63 ± 10.61 years. The primary findings on CT included pulmonary patchy high-density shadows; the density was light and uneven, the edges were indistinct and faintly visible, and the properties could not be determined. The average size of the GGO was 1.08 (range: 0.79–1.6 cm). 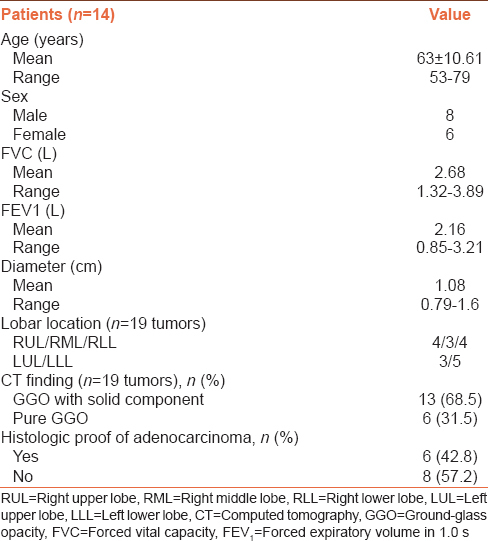 Eight (57.2%) patients with a nodule size of <1 cm did not undergo biopsy [Table 1]. The study was approved by the Institutional Review Board of our hospital. Informed consent to perform cryoablation of the lung GGO was obtained from the patients. All cryoablations were performed using the commercially available Cryocare Surgical System (Cryo-HIT, Galil-Medical Inc., Israel) with argon and helium gas as the cryogen. Cryoablations of the lung were performed under 64-row spiral CT guidance (Siemens Inc., Heusenstamm, Germany). Before cryoablation, patients received general or local anesthesia and were appropriately positioned for the procedure. The intercostal skin of the parasternum was selected as the puncture site. Dr. LZN and assistants (SPL and FM) performed all the cryosurgeries. One or two puncture probes were advanced into the target area using 1.47-mm cryoprobes with three freeze cycles. We obtained a CT scan to confirm that the ice ball had reached sufficient size; the average size was 4.43 ± 0.31 × 3.39 ± 0.45 × 3.20 ± 0.26 cm3. Forced expiratory volume in the 1 s (FEV1), forced vital capacity (FVC), and FEV1/FVC ratio were measured before treatment and 1 week and 1 month after treatment. Each case was assessed three times and the largest FEV1 value was recorded; the error was <5%. Follow-up CT was performed after cryoablation to assess any initial changes in the ablated lesion and any procedural-related side effects. Patients underwent triphasic abdominal CT at 1–3 months after cryoablation and at 3-month intervals thereafter. The study endpoints included adverse events and local efficacy. Toxicity was evaluated using the National Cancer Institute Common Terminology Criteria for Adverse Events version 4.0, and adverse events of grade >1 were noted, including grades 2–4. Statistical analyses were performed using the Statistical Package for the Social Sciences software (version 13.0; SPSS Inc., Chicago, IL, USA). All the patients successfully completed the ablation. CT scans 1 day after the ablation showed exudative changes in the left upper lobe and left lower lung; pneumothorax was noted in three (12.5%) patients, and lung volume was compressed to approximately 5%. [Figure 1] shows the changes in a patient after treatment [Figure 1]. Blood-stained sputum was noted in five (35.7%) patients. One week after cryoablation, lung function was tested, and results showed that the FEV1, FVC, and FEV1/FVC indices were lower than those before cryoablation. However, the indices recovered by >95% 1 month after cryoablation [Figure 2]. The GGO in the lobe of all patients appeared to have been successfully ablated without any recurrence on follow-up CT after an average of 24 (18–34) months [Figure 3], [Figure 4], [Figure 5]. Following advances in cryoablation and imaging, percutaneous cryoablation under imaging guidance was proven to be a safe and effective treatment method for lung cancer.,, Moreover, cryoablation was found to have higher local control rate, and the complications were usually controllable. However, due to the lack of early symptoms and health awareness, most patients are usually diagnosed at an advanced stage, and the overall 5-year survival rate in these patients is only 15%. The Fleischner Society recommends that biopsies or surgical resections should be considered if the solid component of the nodules is ≥5 mm. The Japan CT Association recommended that biopsies or surgical resections should be performed if the screened GGO lesions are >15 mm or if the solid component of the nodules is ≥5 mm. Kuriyama et al. stated that lesions >10 mm should be resected rather than conservatively monitored. Although pGGO is considered malignant, lymph node metastasis not is usually observed in patients with pGGO. However, as it is difficult to distinguish the difference between pGGO and AAH, it is important to identify the risk factors. Detterbeck et al. indicated that pGGOs with a diameter of <10 mm are usually either AAH or AIS. In this study, eight patients did not undergo biopsy as the size of their nodules were <1 cm. Smaller nodules are difficult to biopsy and have a lower diagnostic yield. The American Association for Thoracic Surgery guidelines for lung cancer screening suggested not to perform biopsy for nodules <1 cm. Shimizu et al. reported that CT-guided percutaneous diagnostic yield of only 35.2% in patients with GGO <1 cm. The use of lobectomy for the treatment of lung cancer can affect the pulmonary functional reserve; in particular, the FEV1 decreases by 11%. Hence, a novel treatment method for GGO is needed. Kim et al. were the first to report the cryoablation of a persistent pGGO following repeated surgical resections in a patient with multiple GGO. A 5-mm pGGO in the left lower lobe was successfully cryoablated without any recurrence at the 6-month follow-up. In the present study, each GGO was not close to the edge. Pulmonary lobectomy was the best option, although this would affect lung function. Hence, we performed cryoablation in 14 patients with single GGO, and all patients were followed up for an average of 24 months without any recurrence. The results were satisfactory. By contrast, Kodama et al. reported a recurrence in 14.3% of patients with GGO who underwent radiofrequency ablation. Cryoablation induces immunogenic tumor cell death, which can lead to the expression of all tumor-associated antigens by the tumor cells to T cells. Since several types of lung cancers have a higher neoantigen load and because of the immunogenic tumor cell death, a follow-up immune adjuvant therapy or checkpoint inhibitor therapy might successfully prevent recurrence., In our study, lung function was not affected and was restored within 1 month. It was difficult to perform percutaneous puncture due to the small lesion size and sliding of the GGO lesions. Hence, we proposed a “two-probe” method suitable for cases wherein the first cryoprobe is not inserted into the tumor center [Figure 6]. In these cases, we first inserted the cryoprobe that releases energy to freeze and fix the nodule [Figure 6]a and [Figure 6]b. Then, we inserted the second cryoprobe to complete the ablation [Figure 6]c. Using this method, it was easy to insert the second cryoprobe and place it on its accurate position. With this method, the accuracy, success rate, and efficiency of cryoablation had improved. There were some limitations of this study. First of all, the sample size was samll, we will recruit more patients for later clinical research. Secondly, a randomized controlled trial which comparison cryoabation or lobectomy for patients with GGO are also need. Cryoablation may be a suitable option for patients with GGO who refuse to undergo surgery or biopsy. Cryoablation can be easily combined with other follow-up treatment strategies and therapies. However, a larger-scale clinical trial needs to be conducted using a larger sample size. We would like to thank the native English speaking scientists of Ieping Company for editing our manuscript and Dr. Shupeng Liu's wife Yi Xu's support. This study was supported by three grants from the National Science Foundation of China 81774376); Guangzhou Key Scientific Research grant (201803010059); Scientific andTechnological Plan, Tianhe District, Guangzhou (201604KW009). Hocking WG, Hu P, Oken MM, Winslow SD, Kvale PA, Prorok PC, et al. Lung cancer screening in the randomized prostate, lung, colorectal, and ovarian (PLCO) cancer screening trial. J Natl Cancer Inst 2010;102:722-31. Chen Z, Fillmore CM, Hammerman PS, Kim CF, Wong KK. Non-small-cell lung cancers: A heterogeneous set of diseases. Nat Rev Cancer 2014;14:535-46. Goo JM, Park CM, Lee HJ. Ground-glass nodules on chest CT as imaging biomarkers in the management of lung adenocarcinoma. AJR Am J Roentgenol 2011;196:533-43. Duann CW, Hung JJ, Hsu PK, Huang CS, Hsieh CC, Hsu HS, et al. Surgical outcomes in lung cancer presenting as ground-glass opacities of 3 cm or less: A review of 5 years' experience. J Chin Med Assoc 2013;76:693-7. Kitamura H, Okudela K. Bronchioloalveolar neoplasia. Int J Clin Exp Pathol 2010;4:97-9. Nakajima R, Yokose T, Kakinuma R, Nagai K, Nishiwaki Y, Ochiai A, et al. Localized pure ground-glass opacity on high-resolution CT: Histologic characteristics. J Comput Assist Tomogr 2002;26:323-9. Park JH, Lee KS, Kim JH, Shim YM, Kim J, Choi YS, et al. Malignant pure pulmonary ground-glass opacity nodules: Prognostic implications. Korean J Radiol 2009;10:12-20. Ismail D. 128P: Cryosurgery for advanced stages of non small cell lung cancer (5 years experience). J Thorac Oncol 2016;11 Suppl 4:S111. Niu L, Xu K, Mu F. Cryosurgery for lung cancer. J Thorac Dis 2012;4:408-19. Niu L, Zhou L, Xu K, Mu F. Combination of cryosurgery and iodine-125 seeds brachytherapy for lung cancer. J Thorac Dis 2012;4:504-7. Inoue M, Nakatsuka S, Yashiro H, Ito N, Izumi Y, Yamauchi Y, et al. Percutaneous cryoablation of lung tumors: Feasibility and safety. J Vasc Interv Radiol 2012;23:295-302. Naidich DP, Bankier AA, MacMahon H, Schaefer-Prokop CM, Pistolesi M, Goo JM, et al. Recommendations for the management of subsolid pulmonary nodules detected at CT: A statement from the fleischner society. Radiology 2013;266:304-17. Kuriyama K, Seto M, Kasugai T, Higashiyama M, Kido S, Sawai Y, et al. Ground-glass opacity on thin-section CT: Value in differentiating subtypes of adenocarcinoma of the lung. AJR Am J Roentgenol 1999;173:465-9. Detterbeck FC, Homer RJ. Approach to the ground-glass nodule. Clin Chest Med 2011;32:799-810. Jaklitsch MT, Jacobson FL, Austin JH, Field JK, Jett JR, Keshavjee S, et al. The American Association for Thoracic surgery guidelines for lung cancer screening using low-dose computed tomography scans for lung cancer survivors and other high-risk groups. J Thorac Cardiovasc Surg 2012;144:33-8. 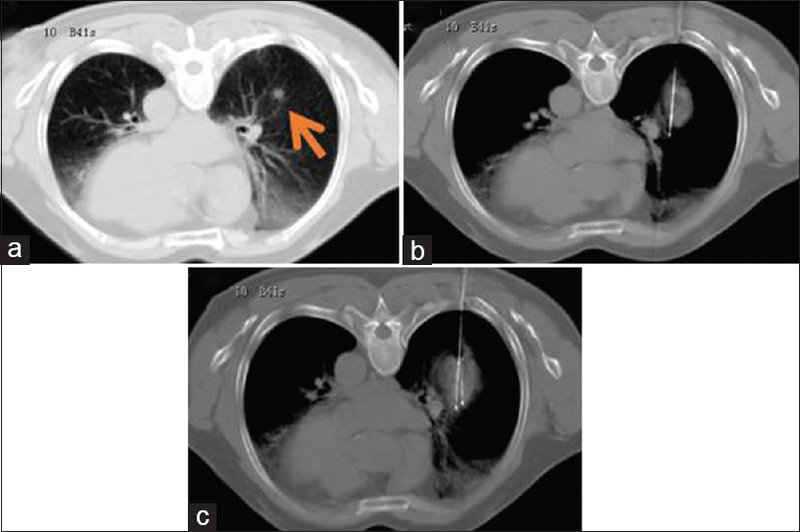 Shimizu K, Ikeda N, Tsuboi M, Hirano T, Kato H. Percutaneous CT-guided fine needle aspiration for lung cancer smaller than 2 cm and revealed by ground-glass opacity at CT. Lung Cancer 2006;51:173-9. Rapicetta C, Tenconi S, Voltolini L, Luzzi L, Scala V, Gotti G, et al. Impact of lobectomy for non-small-cell lung cancer on respiratory function in octogenarian patients with mild to moderate chronic obstructive pulmonary disease. Eur J Cardiothorac Surg 2011;39:555-9. Kim KY, Jin GY, Han YM, Lee YC, Jung MJ. Cryoablation of a small pulmonary nodule with pure ground-glass opacity: A case report. Korean J Radiol 2015;16:657-61. Kodama H, Yamakado K, Hasegawa T, Takao M, Taguchi O, Fukai I, et al. Radiofrequency ablation for ground-glass opacity-dominant lung adenocarcinoma. J Vasc Interv Radiol 2014;25:333-9. Waitz R, Solomon SB, Petre EN, Trumble AE, Fassò M, Norton L, et al. Potent induction of tumor immunity by combining tumor cryoablation with anti-CTLA-4 therapy. Cancer Res 2012;72:430-9. Pfirschke C, Engblom C, Rickelt S, Cortez-Retamozo V, Garris C, Pucci F, et al. Immunogenic chemotherapy sensitizes tumors to checkpoint blockade therapy. Immunity 2016;44:343-54.